Transportation along this barrier island, bounded on the east by the Atlantic Ocean and on the west by Rehoboth Bay and Indian River Bay, was difficult until the Federal government completed construction of two large steel and stone jetties in 1939, stabilizing the Indian River Inlet. The State Park Commission (now the Division of Parks and Recreation) began managing the land as Indian River State Park in 1965, but it didn't become Delaware Seashore State Park until 1967. Two ocean swimming areas, patrolled by lifeguards from 9 a.m. to 5 p.m. daily during the summer season, feature modern bathhouses with showers, changing rooms and concession stands. The beach just north of the Inlet is one of the few surfing areas within the park. Mobi-Mat equipment, consisting of three 30-foot mats allowing those in wheelchairs and power chairs to access the beach from the boardwalk, is also available at the Towers Ocean and South Inlet locations. Two campgrounds, one on each side of the Indian River Inlet, accommodate a variety of camping units, from tents to large recreational vehicles. North Inlet campsites feature three-point hookups (electricity, water, and sewer service), with three-point hookups (electric, water and sewer) and Standard (no hookups) sites, and tent sites available at the South Inlet campground. Two campgrounds, one on each side of the Indian River Inlet, accommodate a variety of camping units, from tents to large recreational vehicles. North Inlet campsites feature three-point hookups (electricity, water, and sewer service), with three-point hookups (electric, water and sewer) and Standard (no hookups) sites, and tent sites available at the South Inlet campground. Get info about camping at Delaware Seashore. Anglers may try their luck along the banks of the Indian River Inlet or on the ocean beaches, and head boats and charter boats launch out of the full-service Indian River Marina, offering wet slips, fuel docks, boat storage, supplies and more. Visit our Indian River Marina page for hours and information. Built in 1876 for use by the United States Lifesaving Service, the full-restored station today features maritime exhibits and historic reenactors who periodically demonstrate turn-of-the-century techniques to rescue sailing ships in distress. Includes a gift shop offering unique coastal and maritime merchandise. Visit our Indian River Life-Saving Station page for hours and information. A special access pier at the Indian Inlet allows the elderly and people with disabilities to get close to the fishing action. Clamming and crabbing are permitted in some sections of the bays; please check with the Park Office for open areas. Marked dune crossings allow surf-fishing access for four-wheel drive vehicles on the beach (permits required). Permits are also required for fishing, clamming and crabbing. Click for information about surf fishing permits and fishing licenses. WARNING: The State online automated fishing license system is NOT compatible with mobile devices or iPads and may encounter printing issues with touch screen computers and apple products. Located at the South Inlet Day Use Area at Delaware Seashore State Park, Big Chill Beach Club is an oceanfront restaurant and event tent featuring an umbrella deck with breath-taking 360° views of the Atlantic Ocean, Indian River Inlet, and Indian River Bay. The Big Chill Beach Club features casual beach fare from breakfast to dinner, full-service cocktails, wine and beer, an oyster bar and Umbrella Bar, fire pit and hang-out game area, beach amenities for the beach-goers, and catered events for up to 200 people. Open daily April to October, 8 a.m. to 10 p.m. A park entry fee is charged March through November. Bury your toes in the sand tableside at Hammerheads Dockside at the Indian River Marina! This full-service outdoor restaurant offers a fresh, vibrant menu with terrific views of the marina. Features include live music, a full-service bar, free parking, and complementary dockage for boaters (subject to availability). Open daily at 7 a.m. during the summer. The shallow bays are perfect for windsurfing and sailing. A non- motorized boat launch provides access for sail boards, kayaks, and boats in the New Road area. 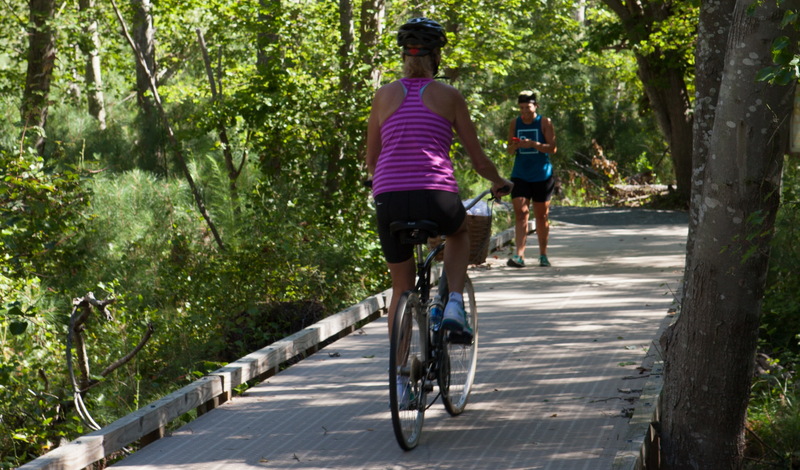 Six different family-friendly trails showcase a variety of habitats for hikers, bikers, or horseback riders, and entertaining and informative programs, such as bay seining and marsh hikes, are held throughout the summer. The park hosts a popular Sandcastle Contest each July, where amateur participants create unique sculptures and castles to compete for prizes. Burton Island Nature Preserve – Enjoy the views of saltmarsh cordgrass. This Nature Preserve is utilized by migrating songbirds and water birds such as black crowned night herons. Amenities: Loop Trail (pedestrian only) Access to Burtons Island is by causeway at north end of Indian River Marina. Parking lot. Bathroom access at Park Office. Thompson Island Nature Preserve – thousands of years of human occupation and mature coastal forest make up this Nature Preserve. Trail access is limited in the Preserve. Visitors can enjoy the beautiful marsh and Island views from the overlook at trail’s end. Amenities: Linear Trail (pedestrian only). Parking on site. The park is open daily 8 a.m. to sunset. November 1 through March 31: The park office is open Monday through Friday, 8 a.m. to 4 p.m.